This may be the first time I’ve written about a political issue here at Social Media SEO, but I just can’t help myself. Tonight, at around 9:20PM, Martha Coakley, the Democratic candidate for the Senate seat in Massachusetts – the one left vacant by the late Edward M. Kennedy – made a call to a lesser known Scott Brown, the Republican, to concede that she had lost, and to congratulate Mr. Brown on his victory for the Senate seat. This highly unexpected victory of Mr. Brown, the Republican, brings a massive shift in the health care reform bill that President Barack Obama is trying to push through the senate. 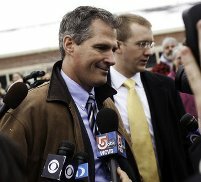 With Scott Brown, the Republican who openly opposes the health care bill, now in the senate, the Democrats will lose their filibuster-proof majority in the Senate. This will be a very interesting story to follow as we see what shape the health care bill takes now in the Senate.